For lovers of L.M. Montgomery (Part 1). Anne’s Alphabet (Hill) – Joyce's mystery and fiction book reviews with some non-fiction too! 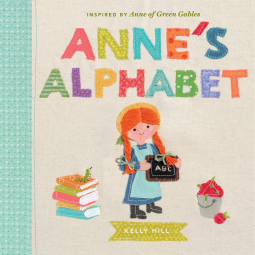 This is a lovely alphabet book in which each letter is represented by something from Anne of Green Gables. The illustrations are particularly charming. While this title may appeal to toddlers, I think that its greatest impact will be with adults who have happy memories of reading the Anne books. Still, this is an opportunity to interest your child from Anne at a young age. Go for it! Many thanks to NetGalley and the publisher for this nostalgic ABC. All opinions are my own.